From the Starboard side of the Promenade, Sterntown's premier shopping and temple district (off limits to sea washed flotsam, scavengers and such) and beyond huge reinforced bulkheads is the Fetid Pit, an air shaft that rises 700 feet to the grey light of the top deck, split by numerous fans that slowly rotate pulling down fresh air and scattering the faint light that leaks from above into maddening kaleidoscopic patterns. 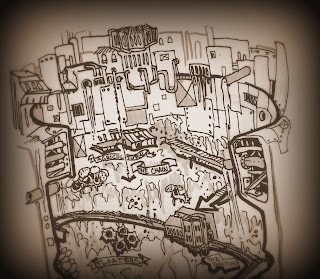 The pit plunges down another 300 feet from the level of the promenade, presumably sealed where the lower submerged decks, the domain of the ash plague, begin. 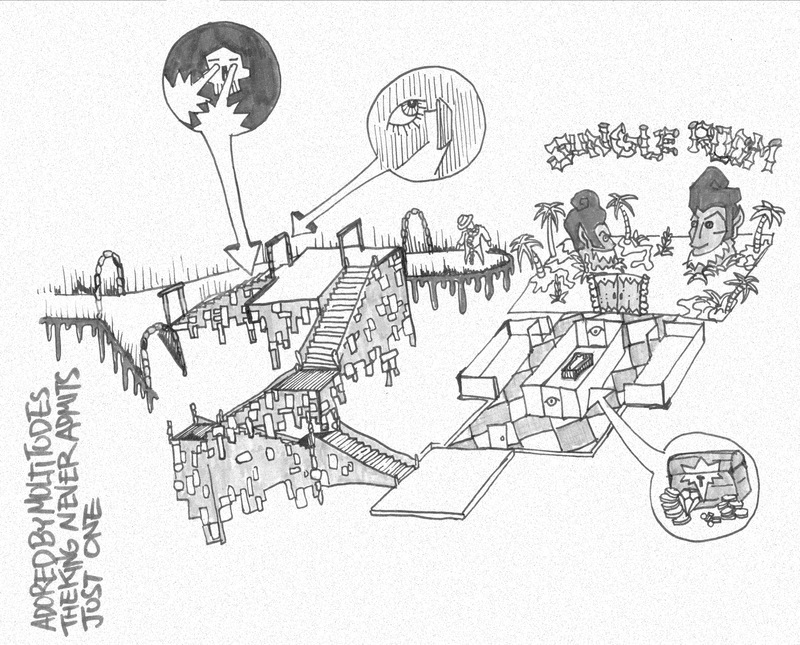 Recently there's been some fun had redrawing a map posted by Will Wheaton on his blog. 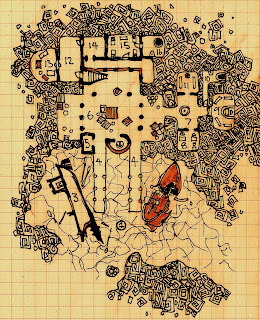 So far Dyson Logos has done a quick sketch of the "Wheeton Dungeon" as has Matt Jackson at Lapsus Calumni (whose excellent maps I've just discovered). Since I couldn't think of anything to map lately I did my own version of the map - as some kind of slimy fish deity temple where the horrible cult god, all scales, spine and giant sightless eyes comes slithering up a ramp to greet/eat its followers. This arrangement was suggested purely by the layout. 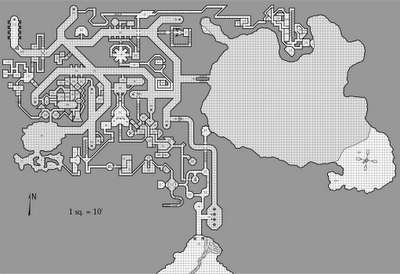 I've fiddled with things a bit placement wise - making corridors shorter mostly. Also used a variant fill - a spiral hatching that I've been trying to get right. 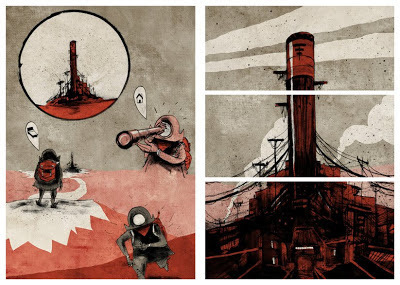 The following are recent exploration notes from several one shots that may provide information about the various semi-explored areas and potential adventure leads currently aboard the vessel. The Marines (strange, insular and vaguely cultish) hired a group of scavengers to go beyond the defenses they maintain in the very aft of the Apollyon and attempt to assassinate or otherwise deal with a troublesome outsider named "Malchris". 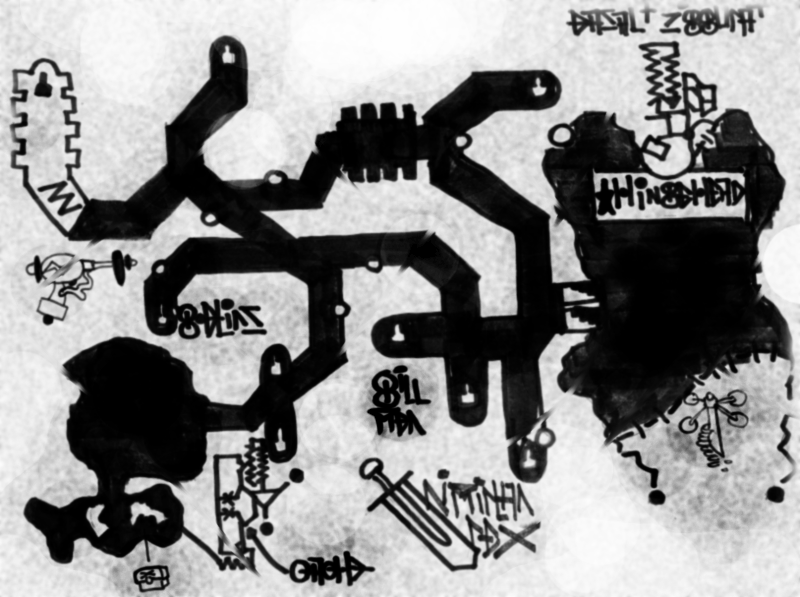 After winding through empty rooms marked with magical traps and strange signs - the Marine's much whispered about Sigil Maze. Within a surly marine scout guide the scavengers were able to reach their destination, a Corrupted Train Station transformed into a hell scape of cinders a and spectral ash figures. After seeing the Devil lord's guard force of spider centaurs and triggering an explosive runes trap they elected to parley. Stretching their moral imaginations the party agreed to help the bug eyed devil enforce a contract for the soul and body of a small passenger class boy, the last of his line - and surprisingly upon their return to the Sigil Maze the proper seeming Marines revealed a depth of pragmatism edging into cruelty and offered to help abduct the boy. The Haldivar Mansion on the upper deck was visited and an elderly caretaker bribed to hand over the child, who proved to have an obvious strain of outsider blood, specifically great bug like eyes and a murderous vengeful disposition. Keen to enroll the aid of a high ranking member of Hell's Nomenclatura for bloody vengeance on his family's tormentors and enemies little Lord Haldivar was glad to go. The party handed over the child to the Devil (who proved to be the child's Great Uncle) and intended to see to his proper upbringing and protection. 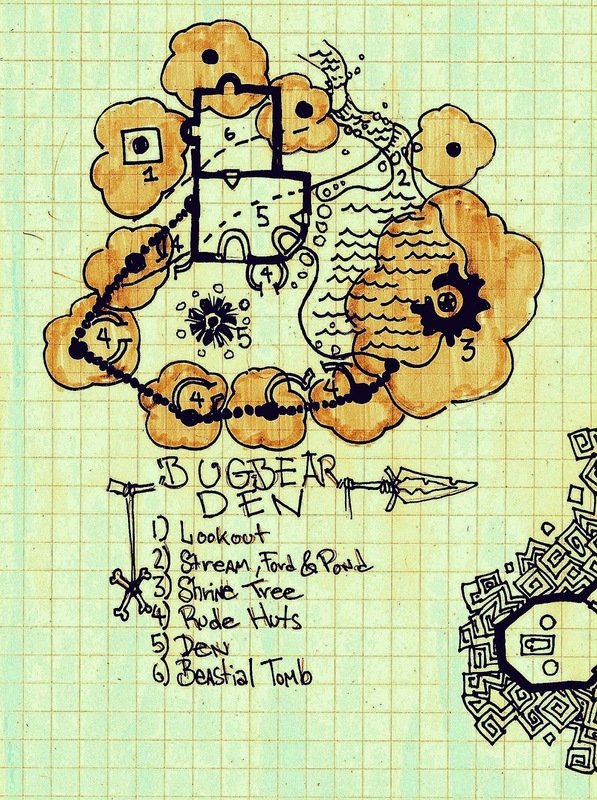 As a result of this adventure the Sigil Maze is open to those on good terms with the Marines for exploration or passage into the outsider lands beyond. 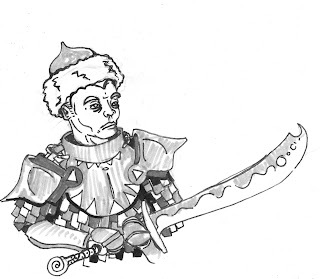 Malchris has offered rides on his train towards the fore in exchange for favors (principally the slaughter of rival Devils) from the Corrupted Station. An expedition to search out allies for defense of The New Lands, specifically a search for a purported group of Black Gang soldiers on Deck 9 had no luck at finding the allies it sought. 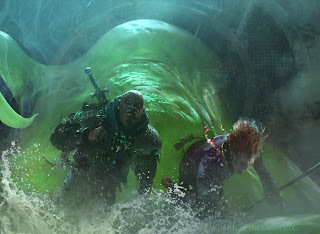 It did discover the partially flooded apartment and entertainment block known as The Grottos where large pools and lagoons crossed by broken bridges and infested with fungus, slime, mold form a swamp like environment below deck. Almost upon entry the scavengers were accosted by a pack of phase crabs, who were very difficult to hit and appear to be some kind of other-planar vermin. 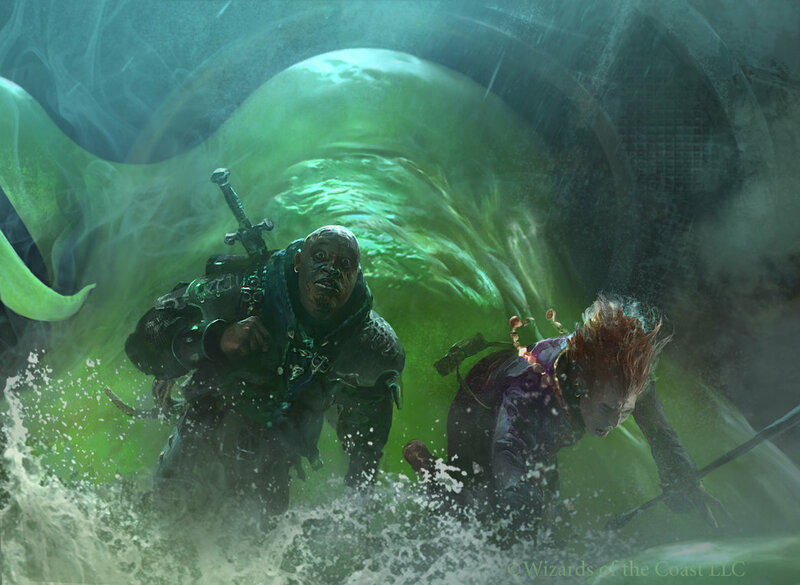 The Party found a broken bridge leading to a Black Bastion but could not find a way across so went Aft and discovered a pool of kelp paddies worked by somnolent and diseased looking humans under the harsh control of grey diabolic overseers. 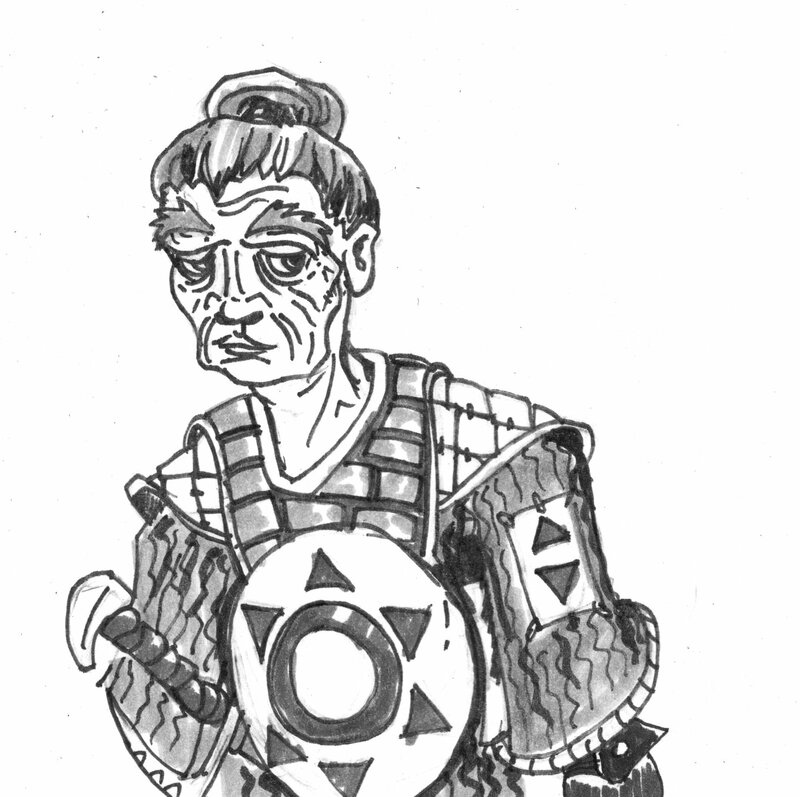 This was the domain of the Last House, a family of passenger class sorcerers who have interbred with their outsider patrons a bit more than normal and for unknown reasons exiled themselves from Sterntown. The Family of the House was friendly enough, putting the party up and feeding them roast shark, but distinctly strange and cruel. 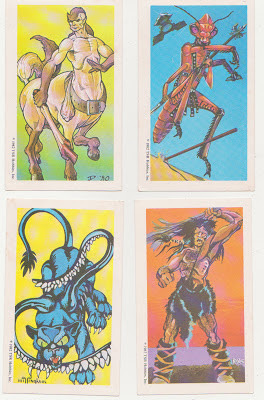 The Family offered to sell some sleep walking gladiators as thralls, but the party did not follow up on this. Discovered the Grottos and the Last House. 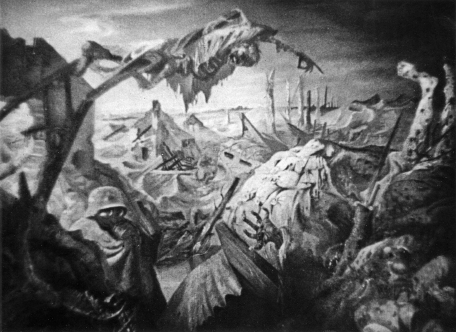 It's unclear what lives in The Grottos beside phase crabs, and less clear what the intentions of the Last House are though they seem powerful, evil and not especially hostile. Returning to the Grottos a different party of scavengers attempted to skirt the broken bridge by moving through the once opulent apartments that arc over the pools, but discovered these are also infested with terrible fungal horrors. 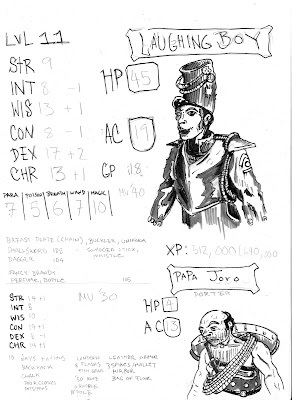 After destroying a Cyan Fungal Pillar the group reached the Black Bastion, which while full of powerful military technology to scavenge was also home to a large pack of Ghola - giant, degenerate, flesh hungry humans who use paralytic poison on thier bone weapons. 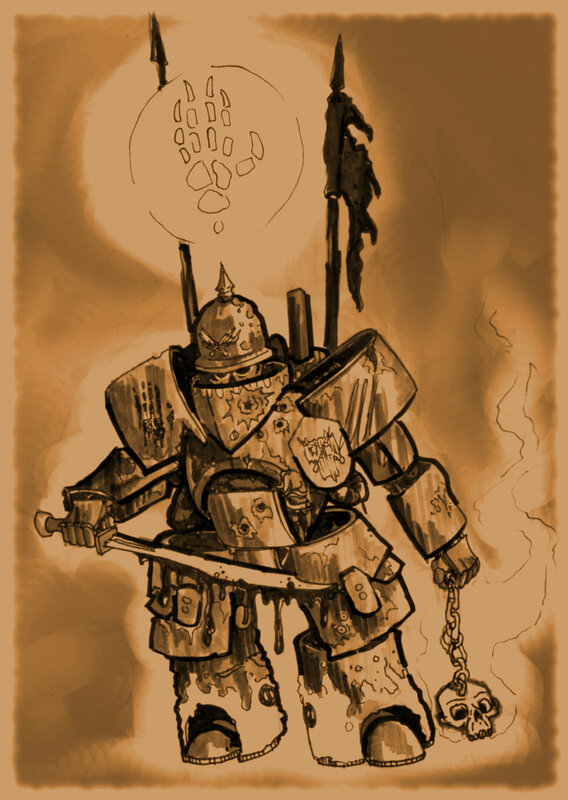 The Ghola were eliminated, and much equipment recovered including a light suit of 4th generation boilermail and a semi functional war golem. Information about the Black Gang has been discovered in the Black Bastion and scavenging companies would be happy to get a crack at the luxury apartments along the The Grottos, despite the terrifying fungal horrors and poisonous molds that grow there in the dark. 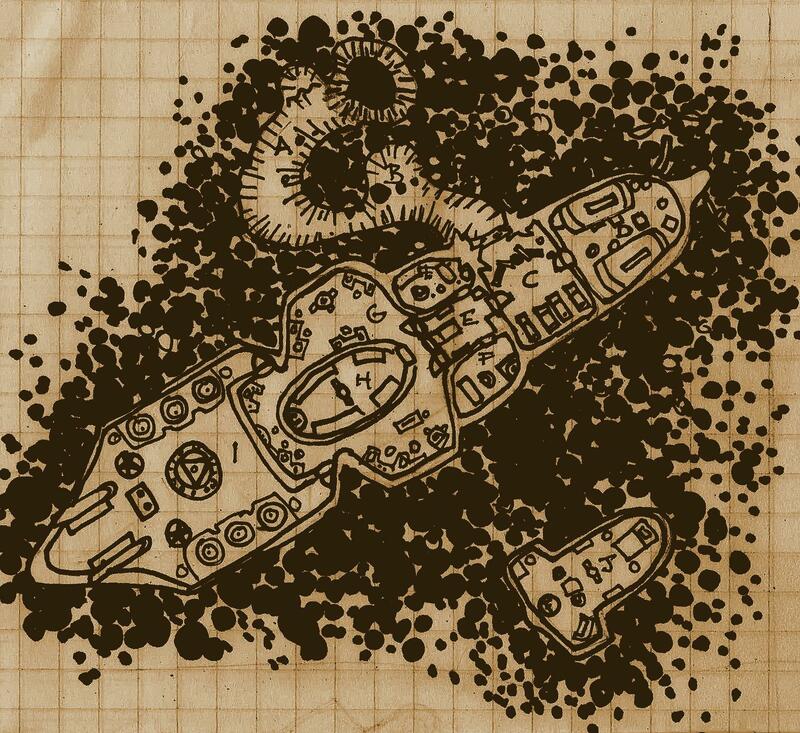 In an attempt to recover the body of an unsanctioned victim of internal mafia violence and aid the Thieves in Law holding a tribunal for the alleged killers a band of scavengers were hired to plumb the depths of the Fetid Pit a huge air shaft to the starboard side of Sterntown. 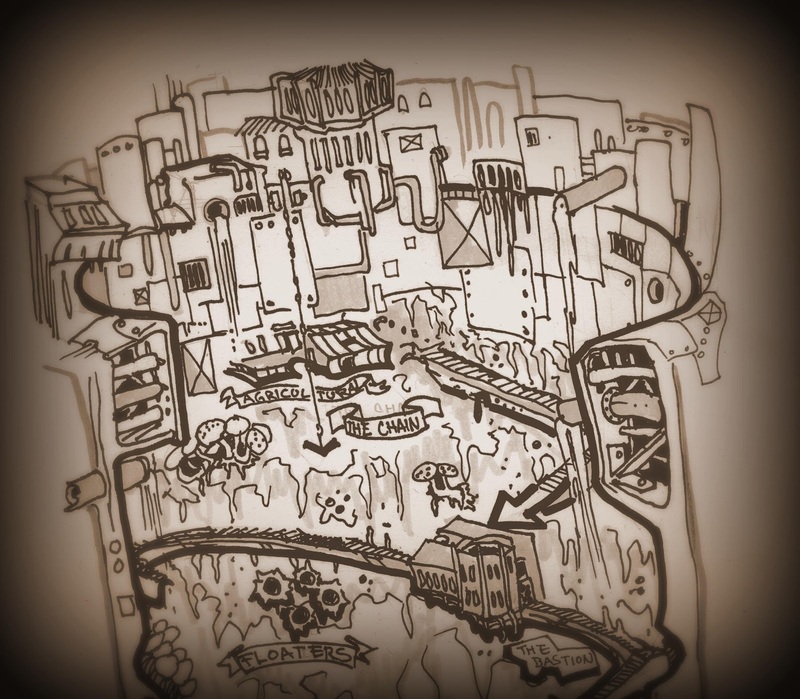 Descending from a Steward guard tower the band spotted a Moribund Agricultural Station, a Floating Gas Angler Colony and finally began exploring an Infested Customs Bastion. 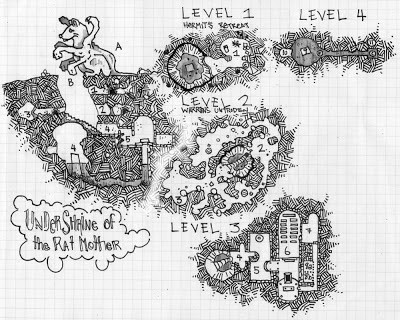 The crawling death infected guardians of the Bastion convinced the scavengers to return to Sterntown, but the fetid Pit clearly holds some valuable and other strange wonders. So the Apocalypse has come and gone and I feel fine. Yet the end of the world is a seductive concept, as every individual always seems to presume they'll be a survivor of the end. Of course in a game you can really have your apocalypse, and so below is a table of ten world ends, in honor of today's non-pocalypse. All are based on literary sources filtered though D&D logic. The world ended in fire, those that are left live huddled beneath the Earth out of the cindered skies and black obsidian deserts. The world ended in ice and sheets of frozen blue still blanket it. Survivors crouch in caves in the lees of volcanos while nightmare creatures of white fur and fangs hunt endlessly through howling blizzard. 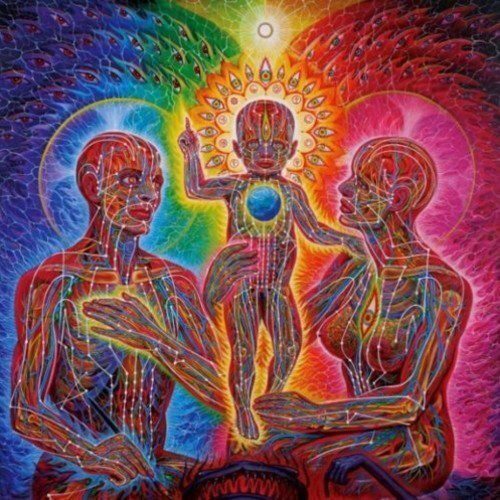 The center of the world broke from divine struggle, titanic magics or simply untold age. Now the fragments drift together a string of strange islands in the vastness of the Empyrean. The Apocolypse Wyrm has come. It's million children poison the Earth with their venom and pollute the sky with toxic breath, ichorous poisons drip from the leaves of every flattering tree. To fight is folly, but their is no other path. As if everyone has stopped in mid-task and walked away, they are simply gone, but a few remain, and things that should not have existed are crawling out of the shadows. The world ended and no one realized, life goes on its ruts and and rituals continue unabated as in a waking dream. Only you are awake from the dream and see the slow sickness spreading as the world contracts and at its edges something alien an antithetical intrudes. Decadence and evil leaking in, the world of the fey has finally broken through and the innumerable courts of the otherworld demand fealty and sacrifice in this one. Things change, melt and shift. All is mutable whimsy, and all is deadly beauty. 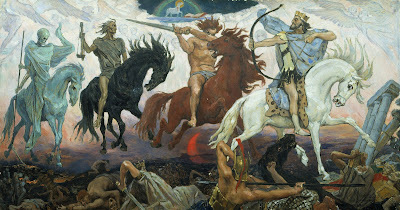 It has stopped, the magic and the gods drained from the world, and with them the cities and cultures of man crumble. The arts are lost, the skills of living without magic or the boons of the gods are vague memories and savagery has reasserted itself. The dying sun has burnt its last, only the moon and the worlds own slowly cooling heat allow any life, there are those who adapt - monstrous, those who struggle - futilely, and the majority who simply die. 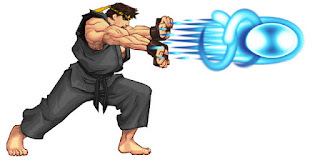 5th Level is when Wizards start to get really dangerous, and one of the signs of their new power to destroy is lightning bolt, deadly area effect spell that is a staple of magic user direct damage spells. In the spirit of my previous posts reskinning sleep and magic missile, here's a set of twenty alternatives for Lightning Bolt. 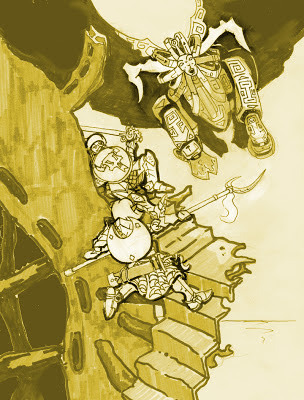 Snakemen are something I keep mentioning in my Certopsian Plains stuff, and Serpent Men make up the ultimate opponent in the Certopsian Situation (which I am trying to get back to working on). 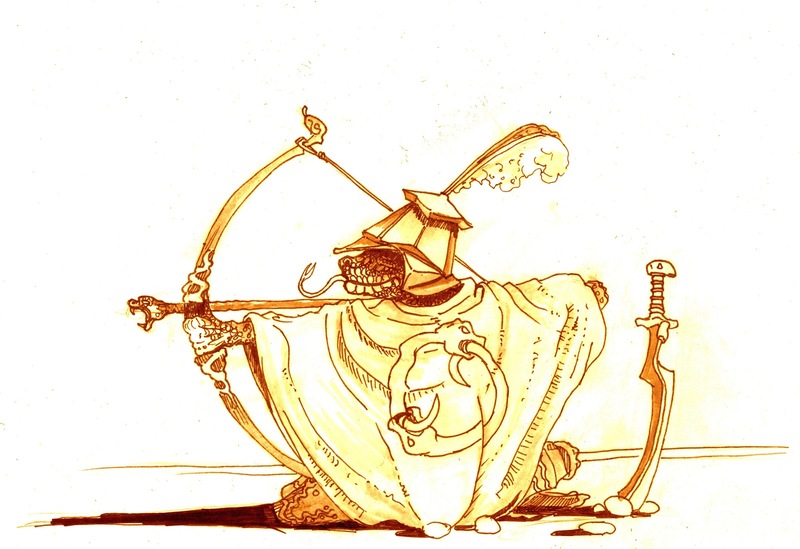 Below is a bit of background, a picture (the composition, idea, and style of which was ripped off wholesale from Moebius) and a basic stat-line. Awakened by strange ritual and dark magics, the Serpent Men have returned to the Certopsian plains after two thousand years of slumber. Once the blood soaked masters of the Land of Thousand Towers, their monstrous 500 year reign was only put to the end by the advance of the Clockwork Matriarchy and it's automaton armies. 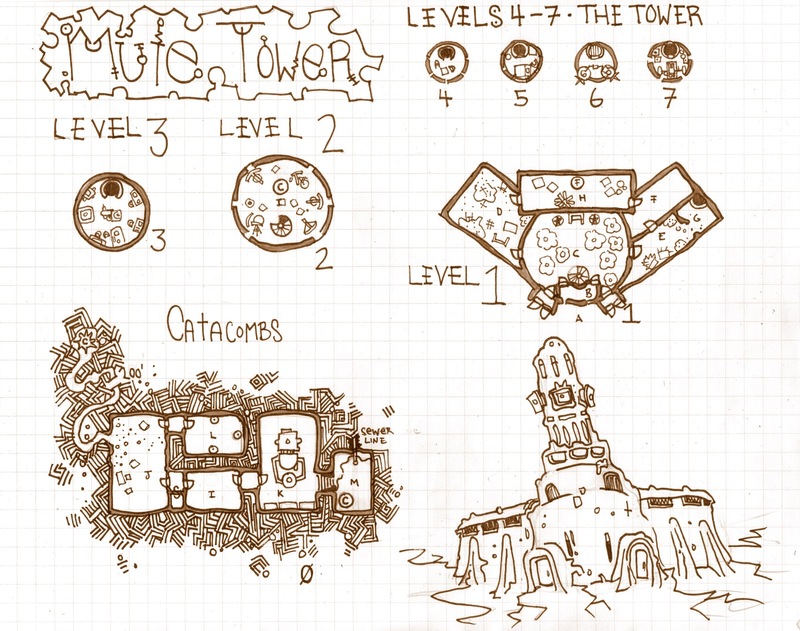 Actually it's four small maps I drew up mostly as a series of tests for new map fills. In the forest beyond the low road an enterprising band of goblins, led by a fairly intelligent servitor species goblin (though they have no hive mind) have set up a small defensible village using an ancient bunker as a base. Using this base they've been successful raiders and scavengers. The key to their success is the use of a huge hollow tree as a spawning shrine for selected goblin sacks that are then heaped with the bodies of victims and animals the goblins hunt. As goblin specialists know, rich nutrients and forest air result in bugbears. 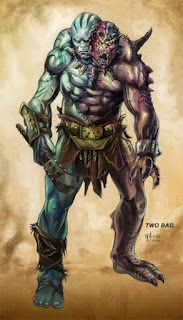 Now the tribe has several, and with this added muscle expect to raise an even larger crop of bugbears soon. Not really a fill map, given it's outdoors - I do like the use of the 20% grey (well now orange) for the trees and think it's a nice way to frame a map when one doesn't have real walls. 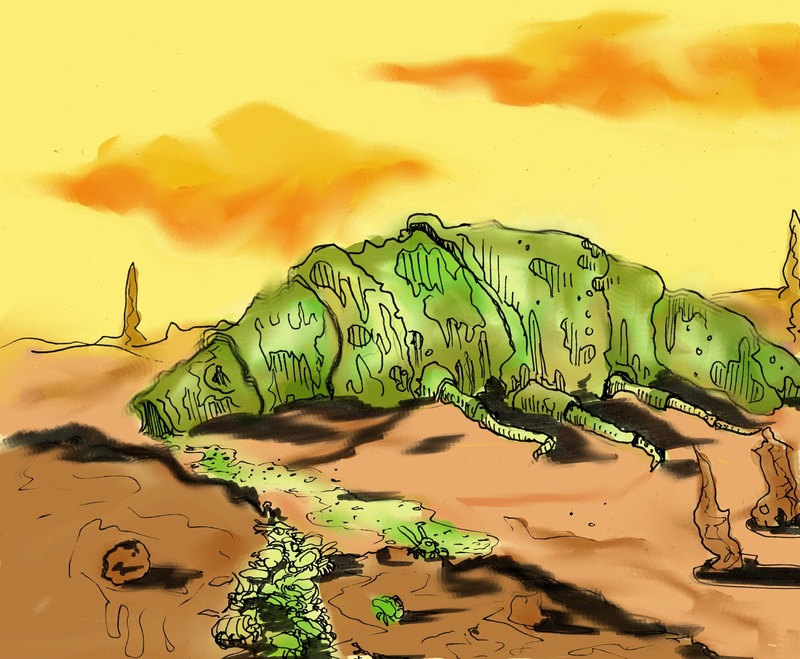 The desert beneath the earth was once a salty underground sea, or what was once a sea is now dry an sunk beneath the earth. 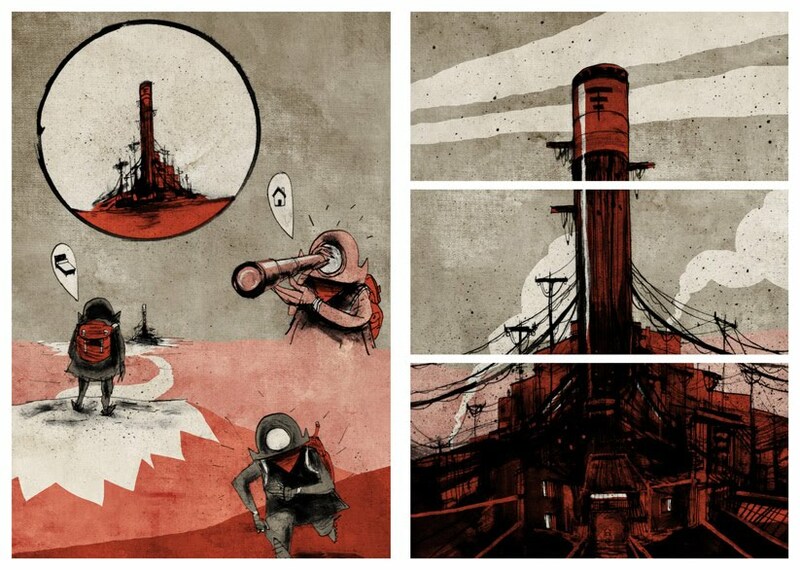 Once a proud trading house the Bleached Harbor is now derelict, with the ruins of a smashed cog and a capsized war galley standing sentry below docks that now raise 15' from hard packed salt flats. Inside the ruin, carved from the rock of a former sea cliff, its interior walls enriched with fossils the trading house is strangely undisturbed. Perhaps it's ghosts, ghouls or demons. Certainly denizens of the salt flats find the shelter of the trading post a welcome respite from the dry scouring winds outside. Used a hatching technique consisting of spirals - Not sure how I feel about it, it's not slow but it's not especially fast either. I think the effect is pretty good, but it doesn't fit well in narrow spaces. I was recently happy to get a very flattering comment from Dyson Logos of regarding one of my maps, which got me thinking about Dyson and his maps. I've always really enjoyed them, they're clean and interesting (especially the way passages cross over each other and they possess a three dimensionality while remaining one level). What I really got to thinking about, because I like drawing maps, is Dyson's crosshatching technique, which even if you have no idea who I'm talking about you will recognize, because almost every map I see (mine included) is using it. By crosshatching technique I mean the way the one fills space, specifically the space on a map filled with rock, earth or anything else more or less impenetrable. 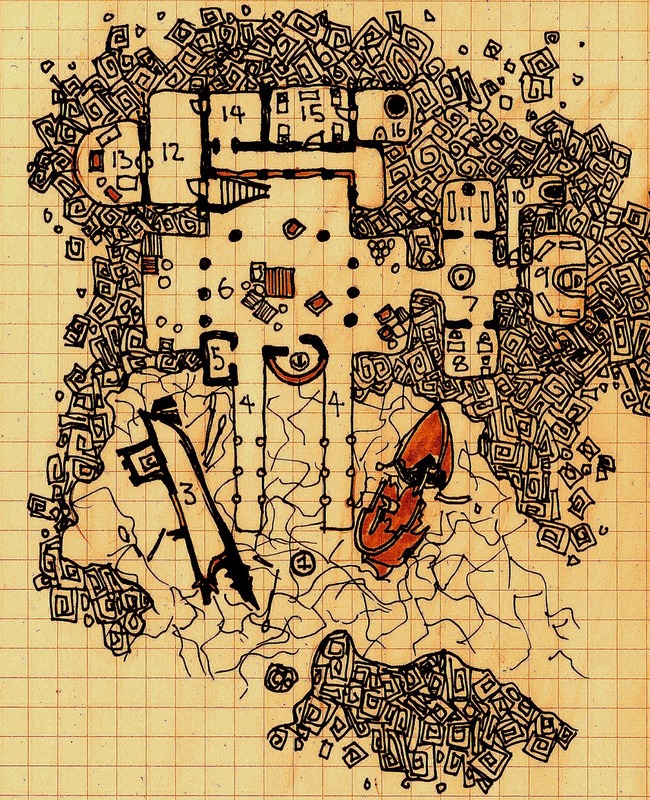 I've been stealing Dyson's great crosshatching, and I want to look into other space filling techniques for maps, because though it's filler, crosshatching adds a lot of character to a map and the character it adds tends to be one of the things that differentiates hand drawn maps from computer drawn. Here are two filler techniques I thought up yesterday night and have applied to these small temples of evil. 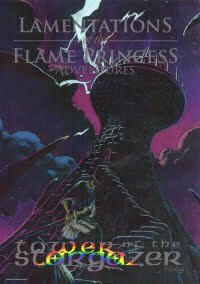 Beneath a stretch of rocky ground and accessed by a narrow stair set within a square pillar in the middle of nowhere, this abandoned temple to a deity of justice gone nasty and draconian served as a prison, ritual torture center and place of sacrificial execution. It is undoubtedly haunted by the spirits of the victims, but could be used as a lair by just about anything/anyone who doesn't mind grim utilitarian decor designed to inspire hopelessness. Prison areas are to the North with drainage pits (certainly also filled with bones), a torture theater and a well. To the South is the ritual chamber and quarters for the Carnifex priests. The fill pattern I used here has a nice effect and is easier than cross hatching, but it is rather time consuming. 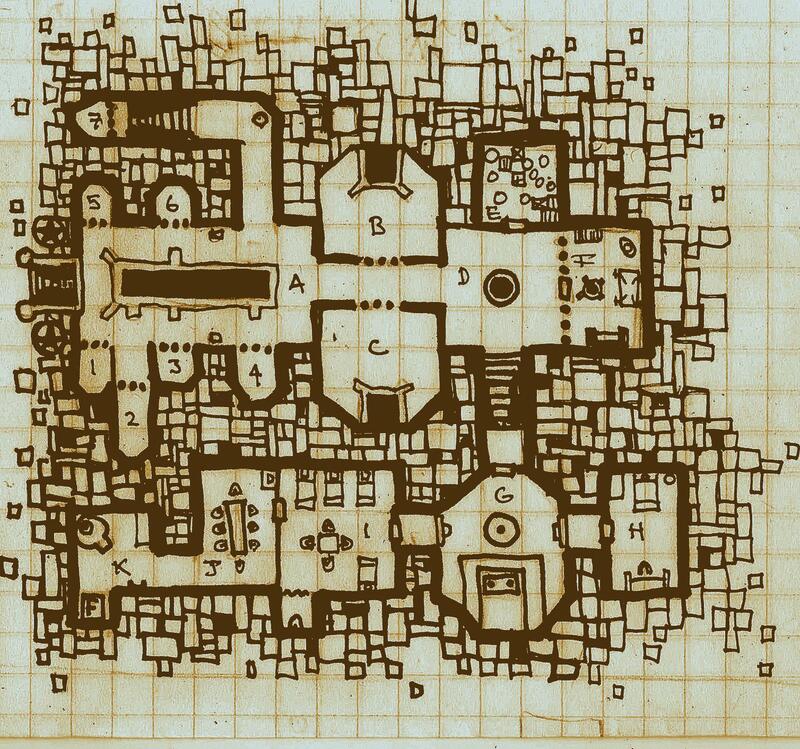 I also think it might work better for a map with rounder rooms as smaller spaces can blend into the block fill. Of course using thick black walls helps keep the negative and positive space separated. Buried beneath the salt pan of an ancient dried lake, or the mud of a shallow marsh a sink hole leads to this ancient submersible. 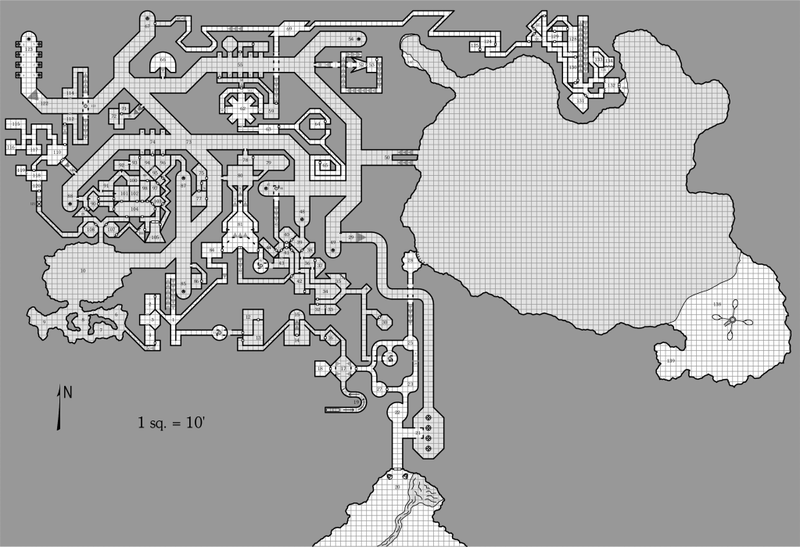 A science-fantasy map depicting a crude temple to some sort of tentacled star god built into the ruins of an advanced technological craft. The guardians reside in the aft, while the head priest or magician has luxurious quarters in the conning tower. The temple itself is built in the missile and torpedo room amongst decaying weapons of mass destruction. I would drop this thing into the Livid Fens South of Denethix in a second packing it with zombie drummers and poison wielding fanatical tribesmen. This fill worked rather will, it's simply stippling in a more traditional way using a large, blunt sharpie. 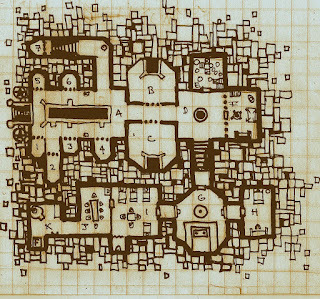 It's quicker than crosshatching and seems useful on maps with a lot of open space as where a decayed or organic feeling might be useful. 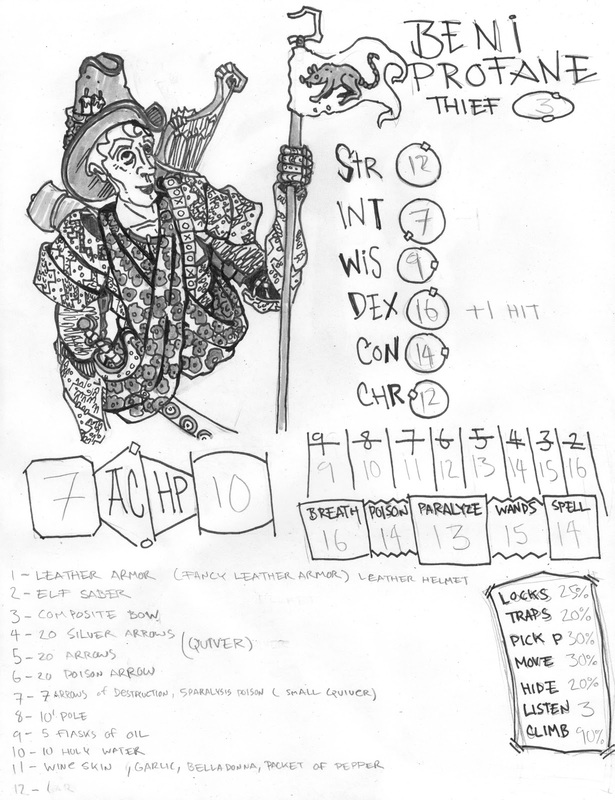 This is a play report, but it's also a review of playing tower of the stargazer using OD&D rules as made sensible and brutal by Brendan of Untimely. I note that the party of 5 PC's (C 4, C 3, MU 2, F 1, T 3) and several henchmen (F2, F1, F1, MU 1, Dog 1, Dog 0) managed to make it through, get the loot and not suffer any damage. I think this is a testament to the sheer deviousness of the GM's own puzzles and traps and the healthy fear the PC's now have for anything and everything. I should add that the dangers in the tower were apparently made more so based on the higher level of the party. After the last disastrous foray into the Pits of Pahvelorn, the adventuring party sometimes known as 'The Order of Gavin" is depressed. 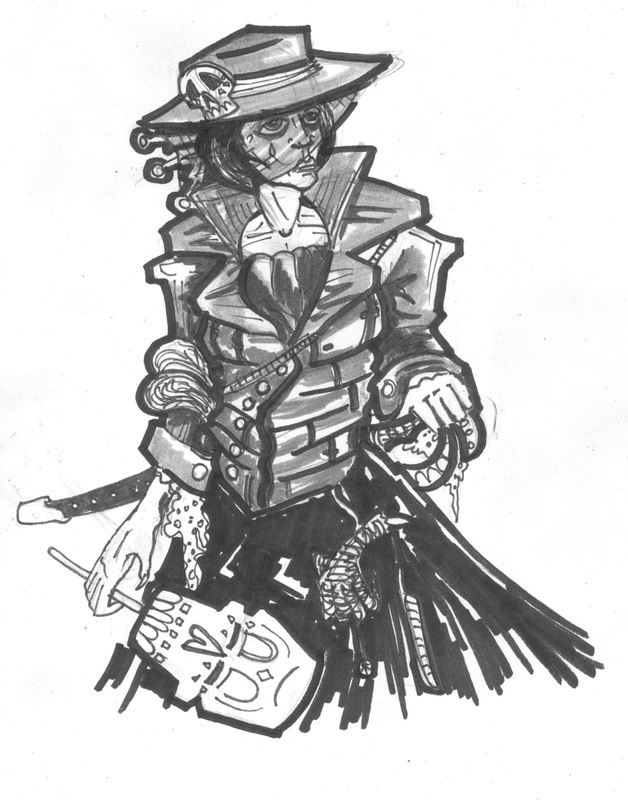 They are broke, have just lost one of their mages (The non-creepy one), had a a favored henchman descend into hysterics and dash unarmored off to his death, exhausted most of their magic items and honestly at wits end about where additional valuables might be located within the Pits. 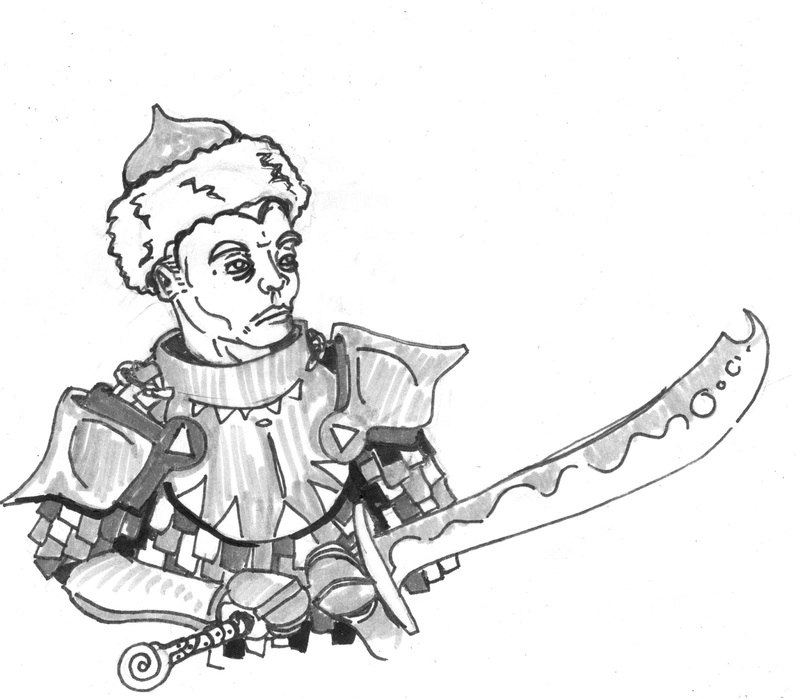 Indeed the powerful wizard does want the adventurers to undertake a mission for him, specifically he claims that an ancient sorcerer of the name Calcidius 'the Great' shared an interest in observing the stars. Clacidius is presumed dead, but he left an intact tower, likely full of high quality observation equipment that Zorpath's wizard is willing to pay 1,000GP for scouting a path to. 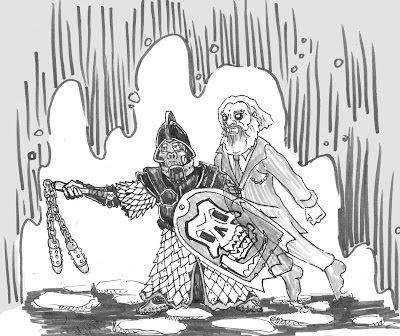 Beni negotiates a byzantine deal where the party will receive a 1,000GP each if they fail to find treasure, and the wizard has a contract drawn up by a strange white haired servant and the party prepares to depart. Citizens of Thistlemarch! To Arms! Recently it has come to the attention of this concerned citizen, as I am sure it has come to your attention as well, that a gang of lawless louts and madmen have taken up residence in our fair town. If the struggles of the stolid frontiersman were not taxing enough, imagine your struggles when faced with the pack of buffoons, cunning men, cold eyed killers and wastrels that haunt the so called "rat-house" of this fair town. Recently this band of scallywags and maniacs have abducted, imprisoned and ultimately executed no less than three individuals for unproven and likely imagined crimes. Furthermore, their numbers grow daily, with new hired thugs riding in from the West and dangerous villains thought gone returning from unknown errands. While undoubtedly you are aware of the recent debacle involving the torturous imprisonment of a large gentleman of the arachnid variety in the center of town and the related hanging of three individuals purported to be bandits, you may be less aware of the return of one of the Rat House's original denizens, the dastardly, obviously insane warlock Chauncy Woolstrike. The monstrous prestidigitator returned shortly before the diabolical revelry associated with the hanging, and orchestrated by the violent killer Ms. Cobweb, who's gentle feminine demeanor some may still remember from when she was employed as a waitress at the hotel, but who is known now for her sanguinary disposition and was recently seen to strike down a citizen of Thistlemarch with a shotgun at a public meeting. In a recent discussion regarding the acquisition of magic in Wampus County the idea that on the frontier normal magical research isn't appropriate, and that perhaps magic (in the form of new spells) can be taken directly from the land and its spirits was discussed. This, combined with a stodgy and restrictive magical establishment, makes the frontier a beacon for wizards, a sort of magical gold rush. A black shadow above the alkali dust. The caravan master shouts and several of the guards, the ones who know the road between Denethix and the Lower Certopsian panic. 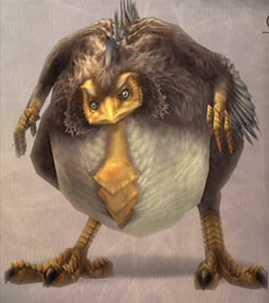 You ask the nearest veteran if it's a nomad attack, he shakes his head, scars shiny in the oppressive sun, "That's not a Snakeman Terrordactyl, it's something worse" he mumbles and then points to a black pillar in the distance. "That there, it reminds you, you've run out of time..." With that the veteran darts off his horse and under a creaking wagon, his lips dry and his crossbow loaded. 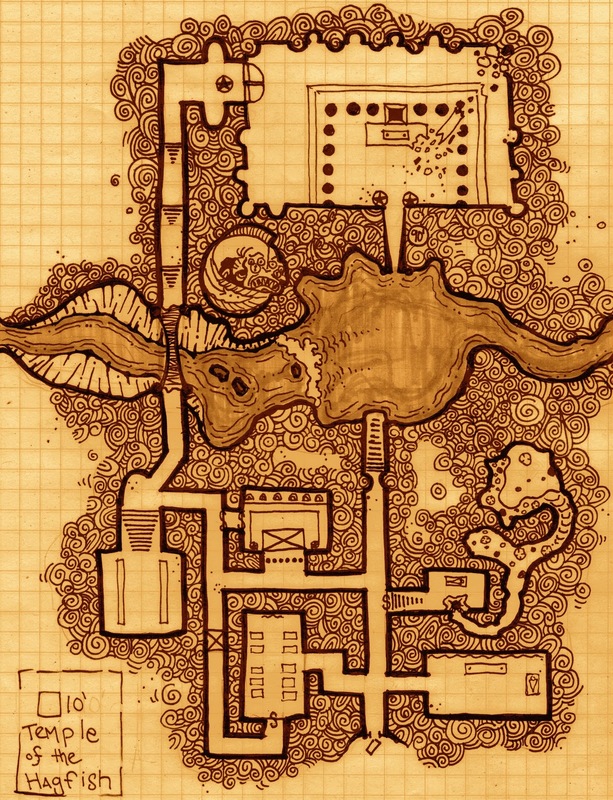 So that map I published a while back with a drawing of a winged gorgon monster - I've got a downloadable PDF of the adventure local. 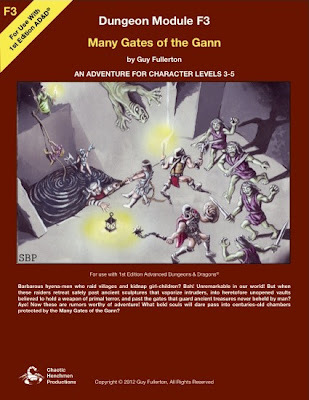 It's under 20 pages, and considerable tougher than the last adventure I put up. Again it's aimed at a party of Levels 3-5. It's a freaking flying Gorgon... This is where my home game would have ended up I think. *On Backstab attack damage is X4 and to hit chance is +4 (unless played by the rules - in which case it's X6/+6hit, without stat and item bonuses). As a follow up to the post of Beni Profane - here's the rest of the Pahvelorn party (with the exception of Sarin the Cleric - who was not around this last session). All were drawn during the tragic session. A short blurb is below each of them. 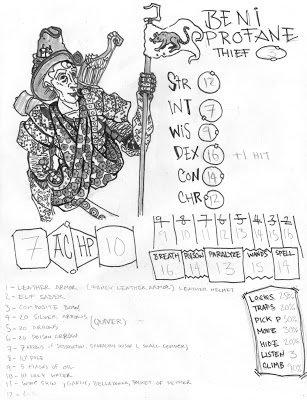 Ogum - The party's current magic-user. 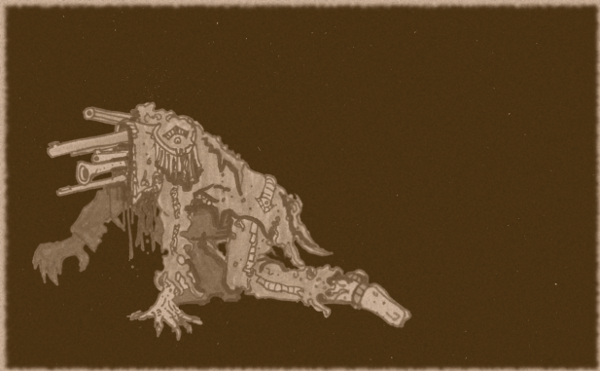 His master himself a former apprentice was torn apart by skeletal rats. 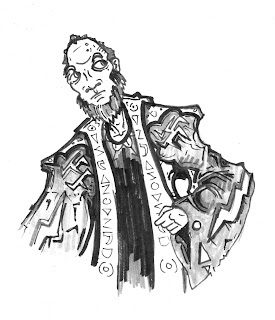 He also knows that the first warlock in the party, a now almost forgotten fellow named "Margo" was strangled by a skeleton. He should clearly be afraid of skeletons. It's not clear Ogum wanted to be a magic-user, rather he had magic use thrust upon him. He's not really suited for it, but he finds himself with a pile of scrolls, spellbooks and magical bric-a-brac. His apprentice is Eahrianna - an orphan moppet of 12 years old who was the former apprentice of the mad wizard Lovitar the Bleak eyed, who Ogum, Higgans and the rest of the party slew. Satyvati was a cheerful sort for a wizard taking up adventuring to pay his creditors after fleeing his home town. 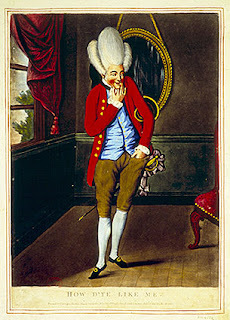 He liked the finer things and spent a large amount of treasure on clothes and a house (which the party have now taken). He was a skilled magic-user all the same - and quite effective with less combat oriented spells. Sadly he was talked into seeing is "Protection from Evil" work on stone guardians. Apparently they weren't evil, and before he could turn tail and run his was punched through the head by an 10' tall statute. Druna is not an adventurer, or at least he never wanted to be one. He was a rich man's body servant, and seemed rather content at that job. 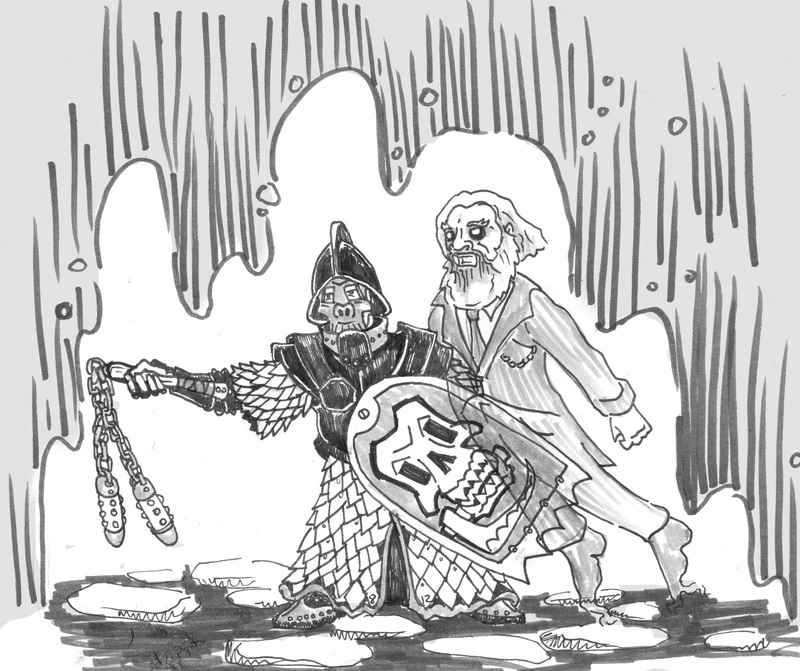 Yet when his master fell on hard times Druna followed him into a new career as a delver in slime filled caverns and plunderer of ancient barrows. Faint hearted and useless at first, apparently Druna had been holding out on his master as he has had some obvious combat experience in his 59 years. No one is sure where he learned to fight: banditry, military service or gladiator pits. All are possibilities, but Druna isn't telling. Tarvis is the party's less contemplative Cleric. A crusader for the Ancient Empire (The established religion in Pahvelorn) he's a bit the bruiser and door kicker. Tarvis is also on the town counsel of Zorptah. His clerical rectitude and zeal making up for any lack of education and intellect. Tarvis is accompanied by Darullian, a local Pahvelorn farm boy recruited by Lune (deceased) in a crossbow contest. Darullian is both smarter and possibly more rational than Tarvis but the two work well together. It should be noted that Pahvelorn is one of the deadlier games played on Google+ that I've seen - 4 PC's and 3 Henchman have died so far in the Pits, which is pretty high given that there is a death save. This is all the more surprising because the party is generally very cautious and frequently goes through a large number of 10' poles, ropes, iron spikes and similar items..
A Deer-Man from some cartoon. 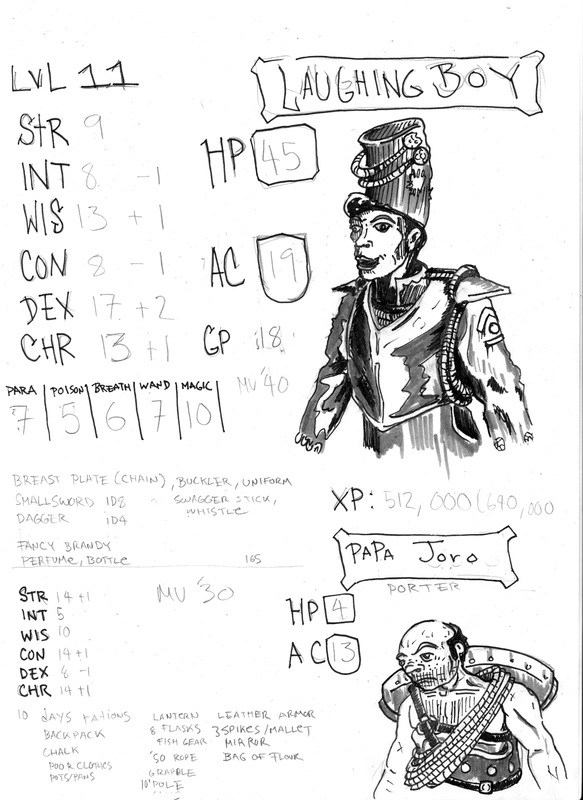 This adventure was played over the course of three sessions and was a resounding success for the party, though it's unclear if the rescue of the an avatar of the creepy lizard god is a good or bad thing. 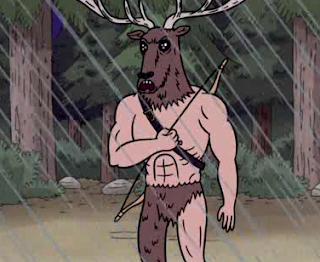 It was however clear that leaving anyone in the hands of a deer demon worshiping human mutating warlock would be a bad thing. After the party, consisting of two priests (Saren the Contemplative, and Tarvis, who Smites), two warlocks (Higgans, the sinister and Satyavati, the dabbler and a former Ratcatcher and Thief (Beni Profane) returned from the buried city of Pahvelorn with a load of plundered goods - the stockpiles of a mage likely transformed into a tentacled horror of some kind by his own thaumaturgical overreaching. 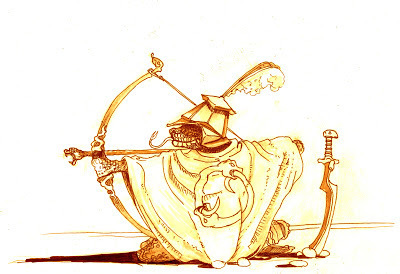 Partially inspired by a petty God of Assassins I recently had cause to make up for my Rat Catcher in Pahvelorn, with a few additions from the Samurai movie "Onibaba" - the Corvus Rex, Crow King or Burning Medicine Spirit, is a powerful monster designed to present a trick or plot advancement rather than an enemy to combat. Though setting one on a character who has betrayed someone spectacularly or finding one in a locked room of a sinister assassin cult would be perfectly reasonable. The Corvus Rex - also known as a Crow King, Raven's Vengeance, Betrayer's Wight or Burning Medicine Spirit is a manifestation created by the psychic pollution of betrayal. 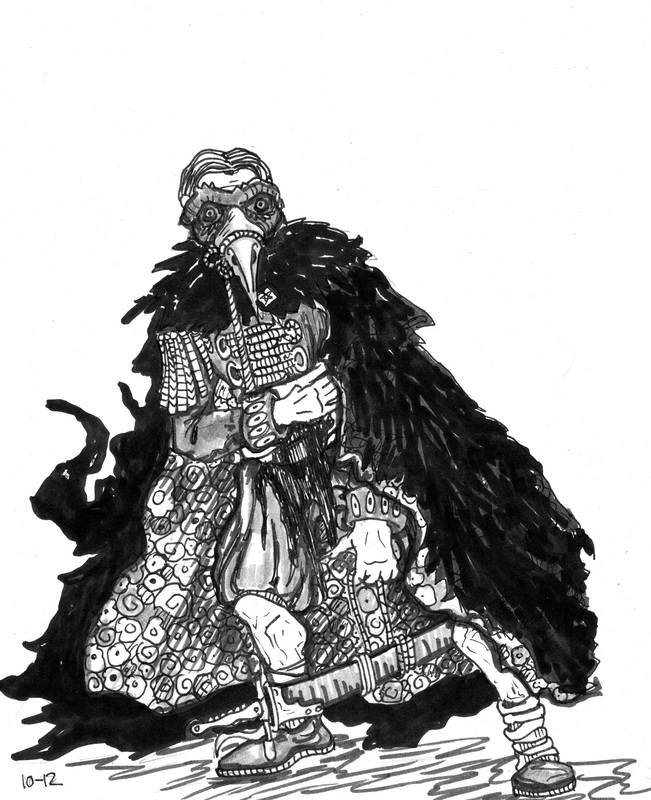 In addition to being creatures called into existence by terrible acts of betrayal Corvus are a weak avatar of the animal spirit "The Beaked Stranger", in its guise as god of assassins. 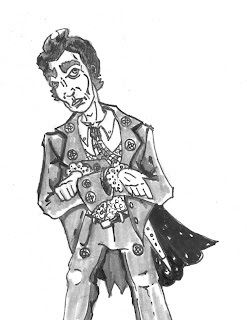 Each entity appears differently, wearing the guise (and body) of a victim of betrayal who was later devoured by crows. This limited set of circumstances lead to Corvus Rex most often forming in the aftermath of great battles, where one side has won through deceit, and most crow kings have the outward appearence of an officer or soldier of a defeated army. Other Crow Kings appear as those who have died by execution and been left on the scaffold for the crows to devour. In any case these spirits manifest when the shock and hatred of the betrayed victim is so strong that the crows feasting upon him have no choice but to carry the word of injustice to their carrion herding god. Really I must finish some content here. It's real life intruding on my active fantasy life I tell you - intruding something brutal. Here's the last bit of work I did for Patrick over at Henchman Abuse. I expect there may be some time for posts come mid November, assuming things don't get real scketchy. ASE II Contains new spells! Player Handouts for Mysterious Discoveries! Crude Maps drawn by Other Adventuring Parties!